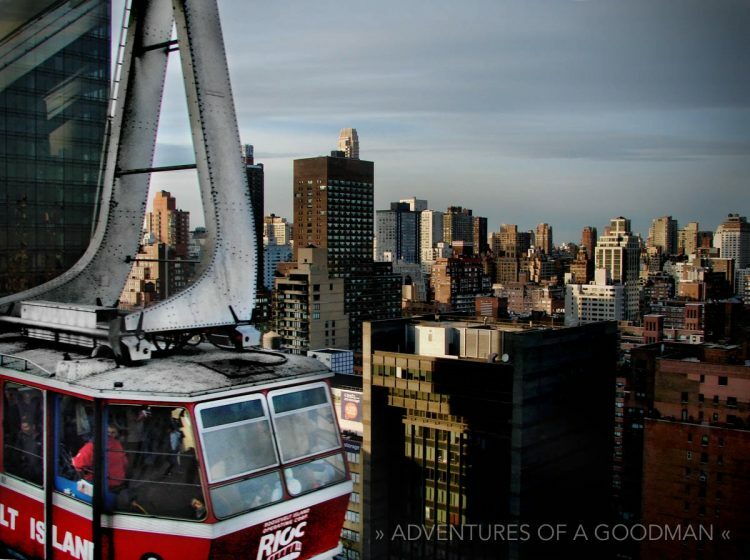 Imagine soaring above the New York City skyline in an aerial cable car every day to get to school. That’s how I spent my childhood on Roosevelt Island … a two mile long and 800 foot wide sliver of land in the East River sandwiched between Manhattan from Queens. What is the Roosevelt Island Tram? The Tram is an arial cable car that connects Roosevelt Island with the east side of Manhattan (59th Street and Second Avenue, to be exact). 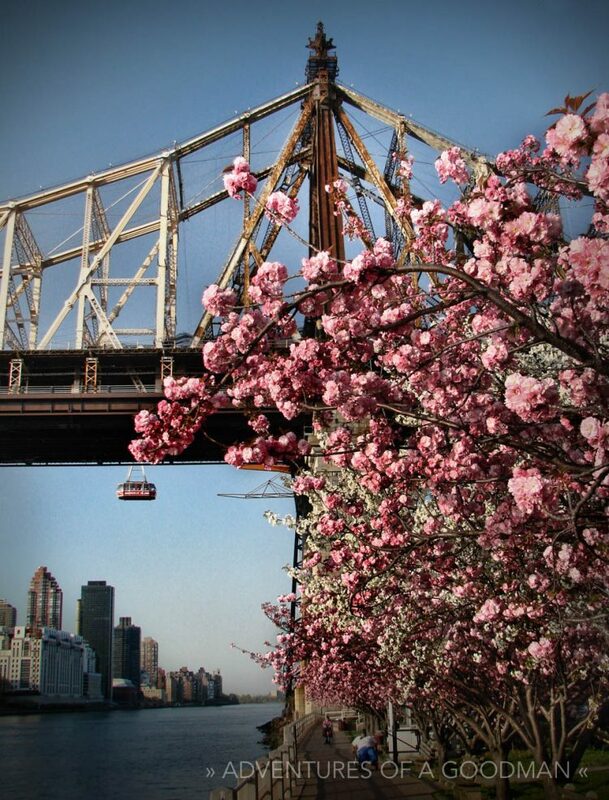 Traveling 250 feet above the East River and alongside the Queensboro Bridge, a ride on the Tram is one of New York City’s most unique activities. Each Tram cabin (there are two in total) has a capacity of 110 people and makes approximately 115 trips per day. An average ride lasts about three minutes. When it opened in 1976, the Tram was the only form of public transportation on or off Roosevelt Island. It was meant to be a temporary solution, while the MTA constructed a new subway station. However, when the Q line arrived in 1989, ridership remained steady … and the Tram has been running ever since. My favorite part of a Tram ride has always been when the other gondola passes mine in mid-air: halfway through the journey. 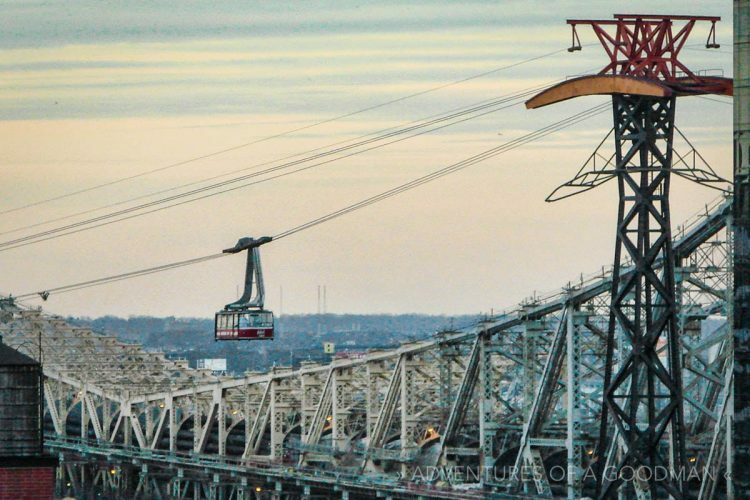 For as long as I can remember, I’ve loved snapping photos of the opposing cable car high above the river with Roosevelt Island or New York City in the distance. The key is to press your camera against the angled corner window … that’s the only way to avoid reflections and glare. Furthermore, you need to be riding in the cabin closest to the Queensboro Bridge. That way, you can get the other Tram cabin, East River, Queensboro Bridge and Roosevelt Island, all in one shot. I once wrote an article about photographing the Tram from this vantage point. You can read it here. 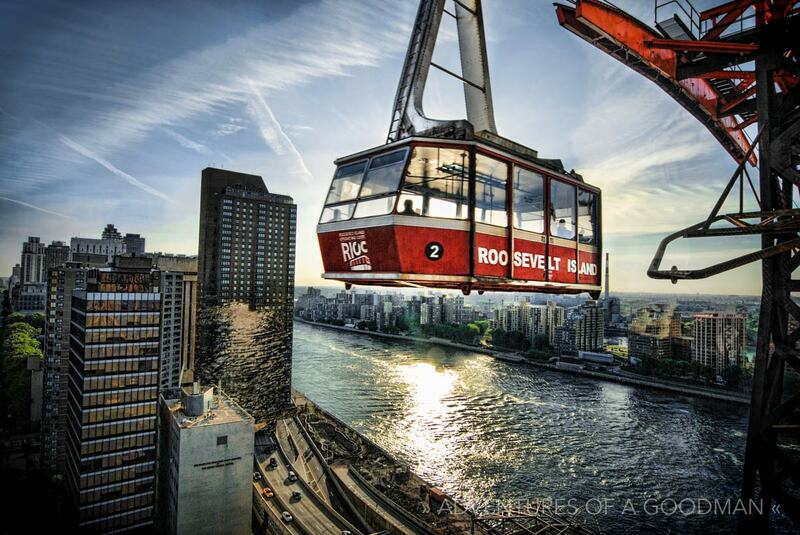 While traveling, I often regale people with stories of Roosevelt Island and its unique gondola. For those who seem especially interested, I also have the Tram on one of my business cards; which opens up a whole new line of conversation. In 2012, I presented my photographic work at Photokina (a photo trade fair). You can bet the Tram was featured in that presentation. A few years before that, a photo of the Roosevelt Island Tram was selected by Local Social to be a part of their Vessels event. Basically, I take every chance I get to tell people about the Tram and the island it attaches to. The Best Ride in the World! For 34 years after it opened, each gondola left its station in Manhattan or Queens at the same time, every fifteen minutes, 20 hours a day. Up to 110 people could squeeze into a single cabin, though at times during rush hour pedestrians were left waiting for the next trip. Life with the Tram was not without its difficulties. It didn’t run all night; and it would be shut down at at any sign of lightning or strong winds. 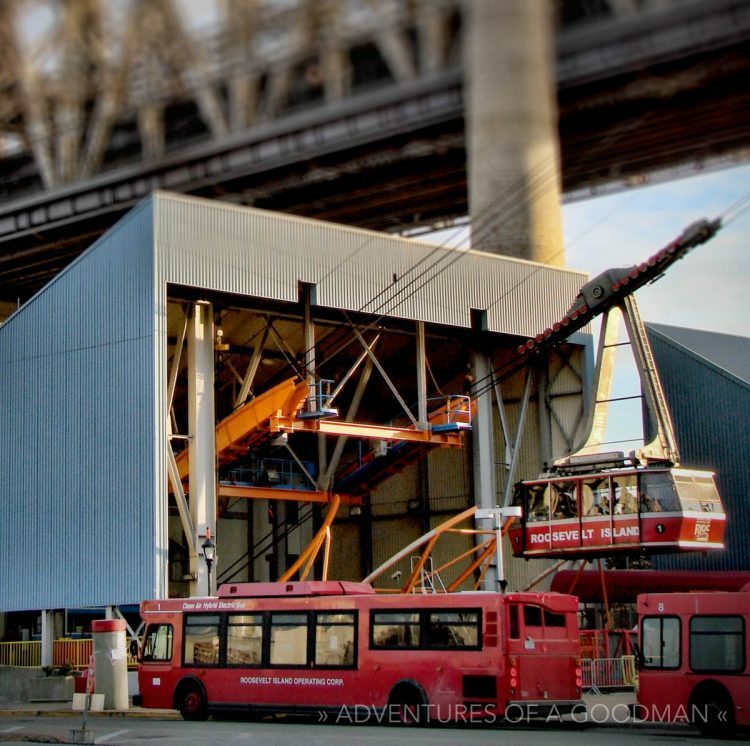 Once, a cabin was once hit by a construction crane working on the Queensboro Bridge. On other occasions, the gondolas have gotten stuck … for varying amounts of time. Perhaps the most famous of these incidents occurred in 2006, when entire Tram system lost all power while the Roosevelt Island Tram cabins were dangling over the East River and 59th Street, respectively. Backup power sources failed and rescue workers had to manually crank a rescue cage up the cables to individually evacuate passengers. At one point, riders literally had cross over a gap dangling 250 feet above the river. This incident would eventually be the lynchpin in a complete overhaul of the Tram … and the replacement of the aging gondola cabins. This cage was dangling hundreds of feet above the East River and passengers had to pass over a gap between the Tram windows and the cage to escape. When the Tram finally reopened after five months of repairs and upgrades, the writing was on the wall. Plans were drawn up for a complete replacement of the entire system and, on March 1, 2010, the classic cabins were retired to their current resting place: gloomily getting dirtier under the Island’s parking garage. 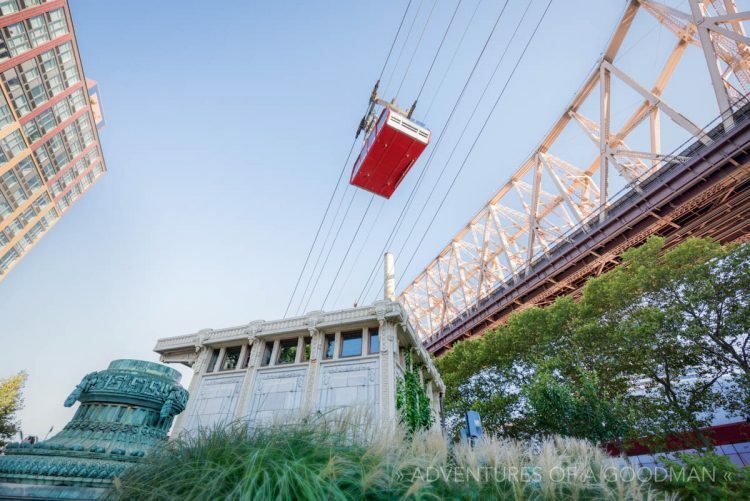 I have heard rumors of turning the old cabins into a welcome center to compliment the Roosevelt Island Historical Society’s current trolley kiosk. I also think one should go to the Smithsonian…but I’m biased. Nine months after closing, the “New Tram” officially opened on November 30, 2010. Among the improvements, the new tram cables and cars are now allowed to operate independently of each other in a “dual-haul” system. Prior to this, the cars had to travel at the same time, which presented maintenance and emergency response issues. 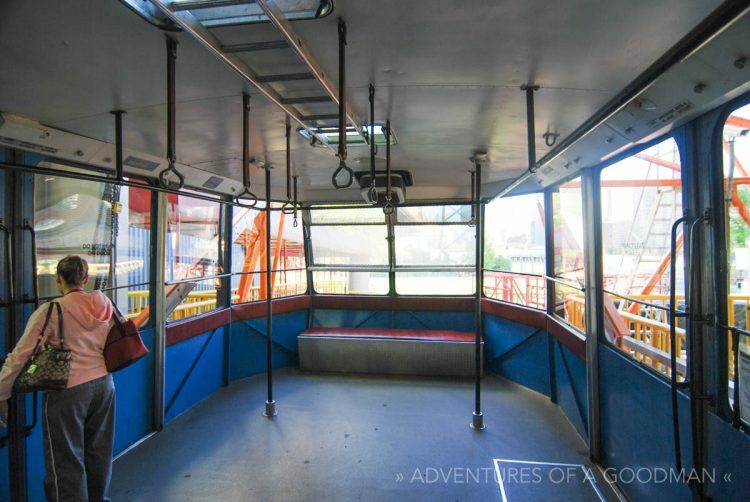 Most of the Tram’s system was also replaced or upgraded, and the entire ride feels more futuristic than ever. Curious to see what Roosevelt Island looks like?